Vintage French Girls in Colorful Lace Hand Painted Photo! Today I’m sharing this Vintage French Girls in Colorful Lace Hand Painted Photo! 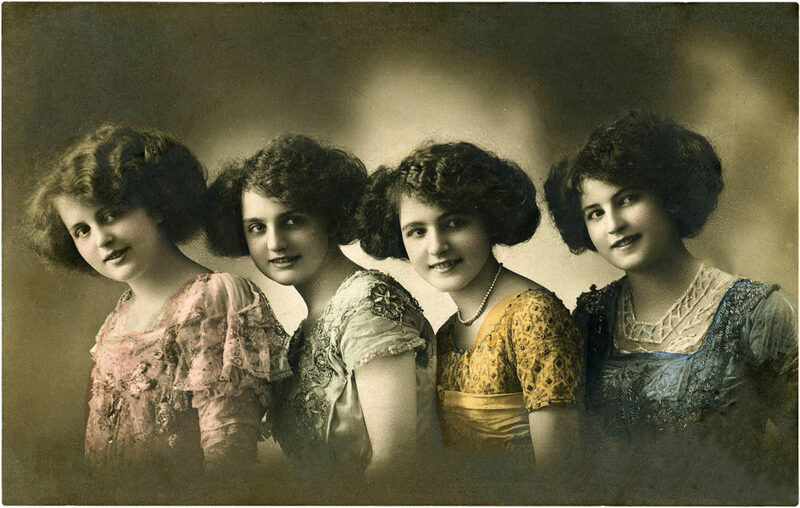 Four beautiful girls, wearing vintage lace outfits, smile shyly in the hand painted photo. The elaborate gowns of pink, green, gold, and teal have lace and embroidered details. Their dark hair has been permed and curls around their faces. So nice to use in your Craft or Collage Projects! Wow, beautiful photo! The bead work detail on their pretty, feminine dresses is just amazing. They sure look like sisters to me! Aww thanks for your work, I love this picture. It reminds me of my older family members. 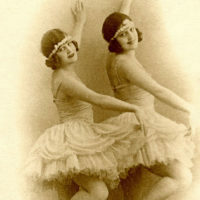 Such lovely dresses – in those days, they had so much detail and lace. That was great fashion back then! Thanks so much for this beautiful image of these ladies or sisters – to me, they are all related. Thanks for sharing this beautiful image, Karen. As always, I so appreciate the time and effort you put into finding these images, fixing them up if required, and sharing them with us.